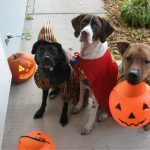 Halloween can be a fun time of year for the whole family – even your dog. However, there are also many potential dangers and sources of stress for … [Read more...] about Happy Halloween! Remember to keep your pets safe today!